TRANSCEND MEDIA SERVICE » The Octagon World: Conflict or Cooperation? The Octagon World: Conflict or Cooperation? Four states, four regions, with cultural-economic-military-political power; surrounded by BRICS[ii]. Emerging Russia-India-China-OIC are on top, declining EU-USA, EUSA in the middle, and “Third World” Latin America-Africa at the bottom–with some military bridges between them. For all eight the term “civilization” applies, with “clashes”. Spacetime, ST, of a pole–seniority as a cohesive entity multiplied by area –and Population, are ascribed attributes, like gender and race; hard to change. GDP and Military Spending are achieved attributes. How come Nos. 5, 7 in spacetime and 6, 7 in population, are Nos. 1, 2 in GDP and military spending? Answer: because they brutally conquered, exploited, stole resources, imposed “trade” keeping the added value; using military spending to keep it that way. Prognosis: more EU-USA warfare like Libya-Mali, more NATO-EU into former USSR. But the victims are emerging; BRICS quickly, Third World slowly; having more to draw upon than declining, outcompeted, EUSA. Up comes China, high on spacetime and population, no . 3 in GDP after EU (not only the Eurozone) and USA, slated to pass both. China has joined the world, equilibrating economy and military spending to the other two, crossing the profiles of EUSA. Germany crossed profiles in Europe 19th-20th century by unifying and nazifying. 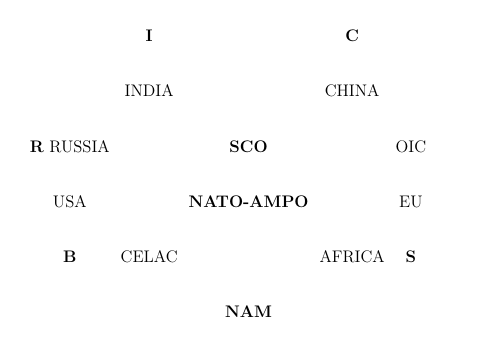 Prognosis: EUSA-NATO attacks in Africa-LatAm; but SCO will deter attacks on the top four. The eight poles in the best and worst light. Russia-India. Russia can learn from India true federalism (Tatars, Chechens etc. ); India from Russia control of own economy. Russia-China. Russia can learn from China about capi-communism, combining the best of them; China from Russia control of own economy. Russia-OIC. Russia can learn more togetherness and sharing; OIC to tolerate secularism and to administer vast territories for ummah. Russia-EU. Russia can learn from EU about a looser federation; EU from Russia about giving up empires (not gifts) with more grace. Russia-USA. USA can learn how to give up empire with more grace; Russia can learn how to get out of stagnation with more innovation. Russia-AU. Russia can learn from AU the search for wisdom in the indigenous past; AU from Russia about watching better own resources. Russia-CELAC. Russia can learn from Celac about diversity in a big region; CELAC from Russia about watching better own resources. India-China. India can learn from China lifting the bottom up; China from India linguistic federalism (for Tibet, Uyghurs, etc.). India-OIC. India can learn from Islam togetherness and sharing over big economic gaps; OIC about federalism (Sunni-Shia) in ummah. India-EU. India can learn from EU about looser structures; EU from India about more solid structures with a single currency. India-USA. USA can learn genuine federalism (Inuits, Hawaiians, etc. ); India to convert caste into class–as USA tries with races. India-AU. India can learn from AU equality for Islam in a big region; AU from India about African unity with linguistic federalism. India-CELAC. India can learn even more diversity, from Cuba about public health; Celac could learn from India about more unity. China-OIC. China can learn from Islam sharing across inequality; OIC from China administration of an enormous territory like the ummah. China-EU. China can learn more diversity and federal structures; EU can learn capi-communism for a better social capitalism. China-USA. USA can learn lifting the bottom up to suffer less and to improve the economy; China can learn more about freedom. China-AU. China can learn from AU more tolerance of cultural diversity; AU from China lifting the bottom up for less inequality. China-CELAC. China can learn from Celac more diversity (two, six Chinas); Celac lifting the bottom up for more cohesion, less coups. OIC-EU. OIC can learn from EU dangers of technocracy; EU from OIC images of a Europe based more on local and less on state levels. OIC-USA. USA can learn about more togetherness and sharing; Islam more about diversity in interpreting religious messages. OIC-AU. OIC can learn from AU efforts to respect diversity; AU from OIC about an Africa based more on local and less on state levels. OIC-CELAC. OIC can learn from Celac to combine Catholicism with secularism and diversity; Celac from Islam togetherness and sharing. EU-USA. USA can learn how to move from a unitary state racially-linguistically to federalism; EU from confederation to federalism. EU-AU. EU can learn from AU more respect for pre-modern wisdom; AU can learn the same from EU, they can both searching together. EU-CELAC. EU can learn more decentralization from Celac; Celac can learn more centralization from EU. USA-AU. USA can learn from Africa before slavery-colonialism; AU can learn about more unity–but also to watch out for a Civil War. USA-CELAC. USA can learn about trade for basic needs and public health from Cuba; CELAC how to make a more solid union. AU-CELAC. Working toward unity and equality with colonial-imperial powers they can learn from each other for shared policies. Yes, they can choose this. Making therapy the prognosis. [i]. BRICS may be seen as an outcome of the Group of 77 that recently celebrated its 50th anniversary. Their theory was terms-of-trade, quantity of resources for a unit of processed goods, how much oil for a tractor, their policy better terms. But the better theory was to do the processing oneself, first Japan, then Japan-influenced countries in East-Southeast Asia, then China, now BRICS. Johan Galtung, “The Group of 77 at Fifty: Congratulations!”, UN Chronicle No. 1 2014, pp. 14-15. [ii]. BRICS may be seen as an outcome of the Group of 77 that recently celebrated its 50th anniversary. Their theory was terms-of-trade, quantity of resources for a unit of processed goods, how much oil for a tractor, their policy better terms. But the better theory was to do the processing oneself, first Japan, then Japan-influenced countries in East-Southeast Asia, then China, now BRICS. Johan Galtung, “The Group of 77 at Fifty: Congratulations!”, UN Chronicle No. 1 2014, pp. 14-15. This article originally appeared on Transcend Media Service (TMS) on 15 Dec 2014. Anticopyright: Editorials and articles originated on TMS may be freely reprinted, disseminated, translated and used as background material, provided an acknowledgement and link to the source, TMS: The Octagon World: Conflict or Cooperation?, is included. Thank you.